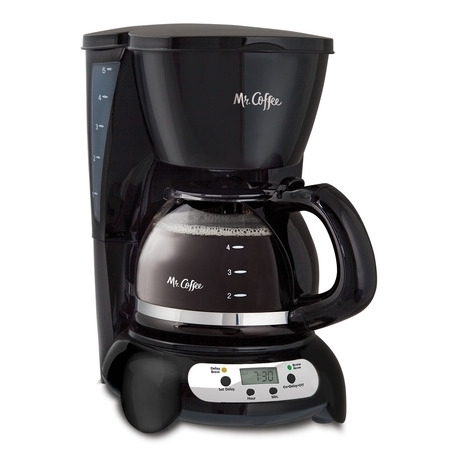 Designed for simplicity, the Mr. Coffee Programmable Drip Coffee Maker delivers an expertly brewed cup of coffee with no unnecessary bells and whistles. Simply set it up, turn it on, and brew. For added convenience, the Delay Timer lets you begin a brew cycle automatically at a later time, so you can have a great cup of coffee later. The Grab-A-Cup Auto Pause feature stops brewing if you need a cup of coffee before the cycle is finished and then resumes when the carafe is back in position. This electric coffee maker has dual water windows that let you see the exact water level as you fill to eliminate overflows and a Lift &amp; Clean filter basket that removes easily for quick washing. The reusable nylon filter eliminates extra mess and the need to worry about running out of paper filters. The one-hour automatic shut-off feature automatically powers down the coffee maker, so you don't have to. 5-cup drip coffee maker with an easy-to-use designSimply fill with coffee and water, turn it on, and enjoy an expertly brewed cupDelay Brew timer to set brew time ahead, so you can enjoy fresh-brewed coffee laterGrab-A-Cup Auto Pause lets you pour coffee before the brew cycle is finishedReusable nylon filter eliminates the need for messy paper filtersLift & Clean filter basket removes effortlessly for quick cleaningDual water windows offer a clear view of water level as you fillOne-hour auto shutoff feature for added safety Designed for simplicity, the Mr. Coffee Programmable Drip Coffee Maker delivers an expertly brewed cup of coffee with no unnecessary bells and whistles. Simply set it up, turn it on, and brew. For added convenience, the Delay Timer lets you begin a brew cycle automatically at a later time, so you can have a great cup of coffee later. The Grab-A-Cup Auto Pause feature stops brewing if you need a cup of coffee before the cycle is finished and then resumes when the carafe is back in position. This electric coffee maker has dual water windows that let you see the exact water level as you fill to eliminate overflows and a Lift & Clean filter basket that removes easily for quick washing. The reusable nylon filter eliminates extra mess and the need to worry about running out of paper filters. The one-hour automatic shut-off feature automatically powers down the coffee maker, so you don't have to. We decided to ditch the Keurig, so we picked out this small coffee maker just to get back in the swing of it. We love it! It works great, you can program it too. It's very small, but makes more than I thought, a full five cups is way too much for my tall travel mug. It's been awhile since I've used a regular coffee maker lol The one thing that really stood out is the flavor of the coffee .. wow :) I'd recommend this coffee maker to anyone, it would also be small enough to travel, and perfect for a dorm room. (Tried to add a couple of good pic, but when you load them up they become distorted). Great little coffee maker! Love the delay brew and the pause brew feature. Mine did come with the nylon filter. Wasn't sure since description said it did but on the Q&A it was stated that it didn't. Coffee tastes very good and hot. So little, yet so big. Love my coffee, for 1. Bought about 2 weeks ago. I just want to have 1 cup of coffee. This is perfect for that. And love that it takes so little counter space. Use to have the single cup (pod/kcups) coffee maker, but just thinking about the mold inside, was enough to get me to switch. My former 12-cup Mr. Coffee died and this little 5-cup was selected to replace it and I love it. It is much less cumbersome to handle and just the right size for my morning coffee needs. I believe the drip process enhances the taste as well. Not having to be troubled with paper filters is a big plus for me, also. I just got this. So don't know if will last. I have not tried the Delay Yet or Program it. But it brews perfect,,is the perfect size for 1-2 people. I have a 5 cup mug, and its perfect,,and I can start another pot right away, and keep it on the warmer for an hour (then restart if I want) Perfect. coffee tastes great..Love the 5 cup types now. The Charafee doesn't pour to nice, but maybe I need to get use to it. Great little coffeemaker purchased 3 yrs. ago and a 5 star review would've been in line, but the top cover opens when in the final brewing stage from the coffee steam. I place a empty 8 oz. coffee cup on the lid to eliminate the emitting steam other than that, it works perfectly. I recommend this item, if you only need 2to3 (8) oz. cups of coffee! Clock is the only problem. Love this coffee maker except for one small detail which some may not even care about. The clock gains about one minute every hour which can mess up the early bird brew time in the morning if you use that feature. Otherwise it makes great coffee and is very user friendly. I would have given five stars - but whoa, this Mr. Coffee is much smaller than I envisioned. Tiny. My friends and I like generous sized cups of coffee and this pot makes two of those. In every other way it works fine. When I'm alone it makes more than enough coffee. Next time I'll go for the larger model. 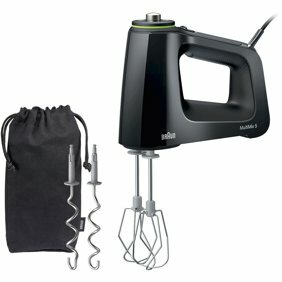 It works as designed, but I have had two problems after about six months of daily use. The top warped leaving 1/4 inch gaps where it was not closed. And, it has just not come on several times. After a few days it has started working again. I am tired of getting up in the morning with no hot water. We apologize for the inconvenience the coffe maker has caused to you. Here at Mr. Coffee we make our products with the highest quality materials and we expect them to last. Please allow us to turn this experience around and give us a call at our toll free number 1-800-672-6333. For your convenience, our customer care team is available Mon-Fri 9am-6pm, EST. We look forward to assisting you! Bought this and paid cash 2 months ago, don't have a receipt so I have to buy a new one because it died quietly. Very disappointing when you're waiting for coffee early in the morning and the coffee maker doesn't do anything. Frankly, I'm surprised because I've always bought the Mr. Coffee brand (decades) and this is the first time it's happened to me. Maybe they're making them differently but anyway, I now have to buy a new one and it will be a different one. Bummer. Thank you for submitting your review. We are extremely sorry to hear about this and even more sorry to disappoint you. We aim to provide great quality products and we'd like for you to be completely satisfied with your purchase and get the product's full benefit. Please give us a call at 1-800-672-6333 from Mon-Fri 9am-6pm, EST. We look forward to assisting you!